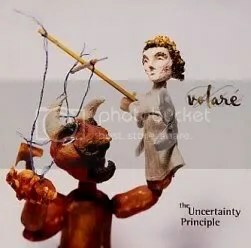 The debut album from Volaré, an instrumental American band with a light-hearted jazzy sound often compared to bands of the Canterbury scene, though Japanese fusioners Kenso were the first resemblance that came to my mind. Vintage keyboards are the high point here, mostly Rhodes piano but some sweet proggy synth surprises as well. Unlike most of the Canterbury bands, these guys are more prone to mix in a lot of symphonic components as well as a harder-than-usual guitar tone on some tracks to keep things interesting. Their 70’s influences (National Health, Hatfield and the North, etc.) are relatively apparent, but this is more than just another band copying their favourites from the past.